You can view the full event here. Discussion about the Frontline Club/New Statesman debate on Saturday has continued in blogs and on Twitter, under #fcnsdebate. The New Statesman‘s two-part coverage of the event plus video of all the speakers, photo library and live blog is here. Video of WikiLeaks founder Julian Assange speaking, not surprisingly in favour of the motion that whistle blowers make the world a safer place is at the end of this post. 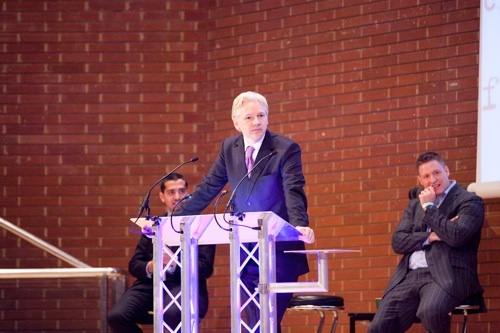 is on the effect Wikileaks has had in Asia, Africa and across the developing world. Certainly among cynical hacks in the London media jungle (or rather, thoses that don’t work for the Guardian), there is a feeling that the “cablegate” leaks didn’t contain much of interest. Though embarrassing for the US State Department, there was a lot of nonsense too, such as the revelation that French premier Nicolas Sarkozy once chased a rabbit around his office. But Assange pointed out that the Indian national paper The Hindu has put cablegate leak-based stories on its front page 21 times in the last six weeks – Indian readers are fascinated by the revelations on Indian government corruption. Elsewhere, Assange’s claims about the significance of revelations on WikiLeaks in the development of an anti-corruption movement in India are reported by The Hindu and Times Now. Dominic Ponsford on Press Gazette’s Wire, focuses on Assange‘s claim that WikiLeaks could have stopped the war in Iraq. The Register headlines on Assange‘s claim that Google hits ‘prove’ WikiLeaks didn’t have the blood of Afghans on its hands. If we lived in an ideal world where we had transparency, freedom of information and real democracy we wouldn’t need whistleblowers. We need some sort of protection for whistleblowers but until then we have WikiLeaks. in a land of atheists, as close to 800 people queued outside Kensington Town Hall in west-central London to hear the words of God.